How many times have you had to ditch your favourite, flavoured coffee just so you could make to work on time? Wouldn’t it be wonderful if you could do both at the same time, not to mention with the same machine? Bodum Travel French Press is the answer to your prayers! Read on to discover how. 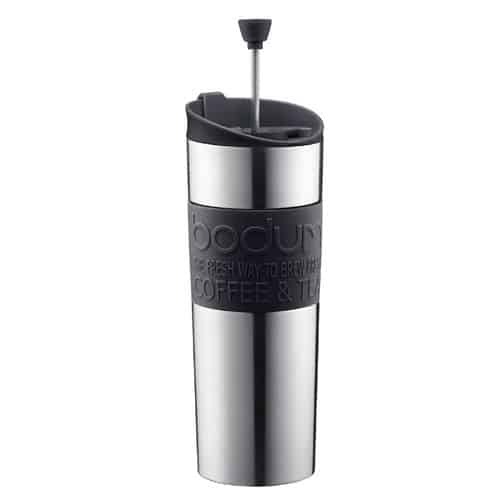 Bodum Trave﻿l﻿﻿ French Press is not only a portable French Press that can brew you amazing coffee, but also a thermal mug through which you can sip coffee without having to reach for your Winnie-the-Pooh mug. Bodum Travel French Press allows you to easily brew and drink from the same pot. You can brew on your way and hit the gym with a warm mug of coffee. Coffee comes out as good as it goes in - so make sure you pick the right grounds for the brew. Having said that, put the grounds in, let it steep for 3 to 4 minutes, add milk or any flavours of your choice, and push the plunger down - you’ll be officially ready to start your day! It is neither a lengthy, nor a difficult process. And since you’ll be doing it on the go, you won’t feel like you’re wasting any precious minutes of the rush hours. Bodum has designed this French Press in such a way that you’d rather feel that it’s only a mug and not a French Press. The lightweight and convenient size make it pretty easy to grab. It’s also the perfect size to fit right into the cup holder in your car - making it highly portable. Double walls of stainless steel come together to insulate the mug, which will then keep coffee hot for nearly 2 to 3 hours. If you don’t like pipping hot coffee then you’ll have to wait for a couple of minutes before attempting to take a sip. Another thing to note is that Bodum hasn’t used any filters here. Instead, it has a plunger mechanism that’ll keep the sediments pressed at the bottom when you taste the brew. Don’t place the mug horizontally - or else you’ll end up flooding the place with coffee. This has nothing to do with the lid or the way it is sealed. In fact, the lid fits snugly and holds the heat pretty well. The problem lies with the drinking hole. If not placed upright, coffee will eventually seep out of this hole. Which also means that, thankfully, it won’t leak if you accidentally tip it over. Just make sure you won’t stuff it into your bag that way. Though a minor drawback, we still wish the manufacturers would look into it. If you keep in mind that this isn’t a high-end model, you won’t end up being disappointed. After all, there’s only so much 20 bucks can buy you. You don’t find good coffee everywhere and not all work places offer unburnt and favoured coffee. If that is the case, Bodum Travel French Press will be a life-saver. It’s the perfect size and weight to accommodate you on your various trips from camping to road trips to hikes and more. You can also take it to your classes, gym and whatever the place with expensive or gruesome coffee. Just pack it in your bag and go! Though the 15-ounce capacity of Bodum Travel French Press sounds enough for two, it isn’t. You’ll actually get less that 15 ounces - which is usually not the amount to share. If you and your partner both needs coffee at the same time, everyday, then you’d better buy two French Presses instead of one or a bigger French Press that’ll serve you both at once. A portable French Press in the form of a thermal travel mug, Bodum Travel French Press will brew you coffee anywhere, any time. The price is the biggest bonus of all, making it a readily available option to anyone on the market for a travel mug. It has the looks to go with it too, and quality that will last well past the years you have in mind. A portable French Press in the form of a thermal travel mug, Bodum Travel French Press will brew you coffee anywhere, any time. The price is the biggest bonus of all, making it a readily available option to anyone on the market for a travel mug. It has the looks to go with it too, and quality that will last well past the years you have in mind.